The state of your oral health has a big impact on your quality of life at any age. Healthy teeth and gums allow you to eat well, speak clearly, smile confidently, and to be your best in social and professional situations. On the other hand, oral health problems such as tooth decay and periodontal (gum) disease can be painful — and expensive. Poor oral health can even adversely affect your general health: Scientific research has established links between periodontal disease and systemic (whole-body) health problems such as heart disease and diabetes. The good news is that maintaining oral health is not difficult, as long as you have a good oral hygiene routine in place. Ideally, attention to oral health should start as soon as the first baby teeth appear. Let’s take a look at the most common oral health concerns by age. Even new baby teeth can decay if not cared for properly. The chances of this happening increase dramatically when children are allowed to fall asleep while drinking from a bottle filled with any liquid but water. That’s because even formula and breast milk contain sugars that encourage the growth of decay-causing oral bacteria. When a child falls asleep with a bottle, those sugars can pool around the teeth for hours at a time. The same is true when a baby falls asleep at the breast. So once the first teeth start to emerge, it’s time to break this habit. That’s also the time to institute an oral hygiene routine. Start by wiping your baby’s teeth after feedings with a clean, damp washcloth. Teeth that have fully grown in can be brushed with a soft-bristled, child’s toothbrush and a thin smear of fluoride toothpaste. Regular dental visits should begin by the first birthday so that your child becomes accustomed to the dental office and all the important preventive services provided. Tooth decay is the most common chronic disease of childhood, yet it’s completely avoidable with good oral hygiene, a healthy diet, and regular dental visits. 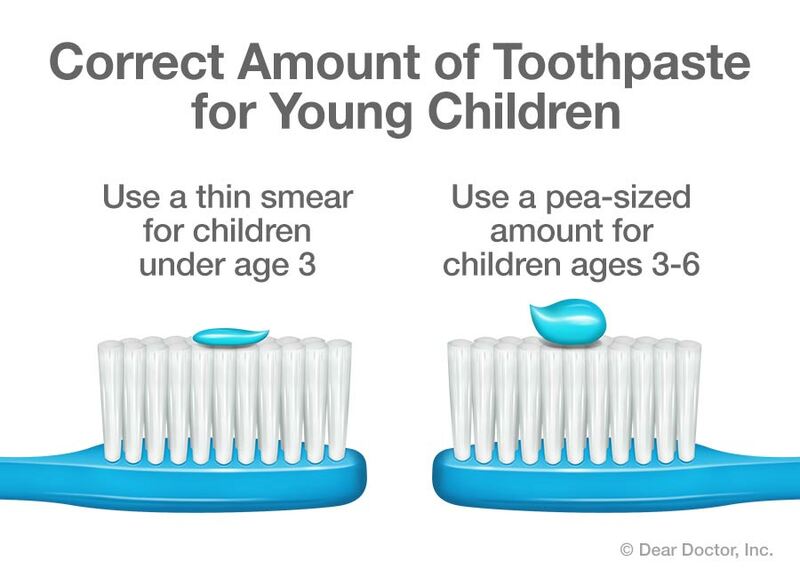 Starting at age 3, children should be taught to brush their own teeth with a soft-bristled toothbrush and a pea-sized amount of fluoride toothpaste. They will continue to need help with oral hygiene, particularly flossing, until they’re about 6. They also need to understand the importance of avoiding sugary snacks and drinks. Although baby teeth aren’t meant to last forever, they serve the same important functions that adult teeth do — making sure a child can eat and communicate comfortably. However, primary teeth perform one additional role: They guide the permanent teeth developing under the gum into proper position by not “letting go” until a new tooth is ready to come in. So if a baby tooth is lost prematurely, from either decay or trauma, this could set the stage for orthodontic problems later on. That’s another reason why every effort is made to treat decayed baby teeth until they’re ready to be lost naturally. And speaking of orthodontic issues, these usually become apparent around age 7, when a child has a mixture of both primary and permanent teeth. Regular dental visits will ensure any oral health problems are caught and treated as early and effectively as possible. Tooth decay remains a concern through the adult years — particularly for seniors, who take more medications than younger adults. Many common medications can dry out the mouth as a side effect, which can make your teeth more susceptible to decay. Another common threat to adult oral health is periodontal (gum) disease. This problem is much more common than many people realize, and it doesn’t always display obvious signs. Even the signs that do appear, such as bleeding during flossing or brushing teeth, are often overlooked. Yet untreated gum disease can cause teeth to become loose, and even fall out. The best defense against gum disease is preventing the buildup of bacteria-filled dental plaque and tartar: and that requires good oral hygiene at home and professional dental cleanings on a regular basis. Your regular dental exam also includes a screening for oral cancer — a significant health threat that affects adults of all ages. Sometimes adults juggling many responsibilities — work, parenting, seeing to the needs of elderly parents — forget their own routine oral health needs, and find themselves with dental problems that could have been avoided. While it’s always better not to let things go, it’s important to realize that help is available for dental problems at any stage. In fact, it’s never too late to brighten up your smile. So if it’s been a while since you’ve had dental treatment, make an appointment and we’ll get you back on track.